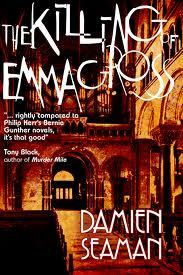 March 1st 1929 in Dusseldorf and working girl Emma Gross is murdered in a pay-by-the-hour hotel. The murder and a handful of others are attributed by Inspector Michael Ritter to a young man with learning and behavioural difficulties, cast as copycat murders of a notorious killer, nicknamed ‘the ripper’, who’s at work in the area. May 1930, the killings are continuing, a young girl has disappeared, and the infamous Inspector Gennat has been drafted in from Berlin Kripo to head up the investigation. Detective Thomas Klein has been tipped off as the identity and location of the ripper by a young woman who escaped his clutches. Ritter’s former partner, Klein has been banished to the suburbs for sleeping with Ritter’s wife, his reputation smeared with allegations of communist sympathies. Seeking a lifeline back to headquarters, Klein tries to bring in the ripper by himself, but his plan is thwarted and he instead ends up in hot water. Ritter wants him drummed out of the force, but the only person that the ripper, Peter Kurten, will talk to is Klein. The more Klein interviews Kurten, the more convinced he is that the copycat murders were performed by him, with the exception of Emma Gross. The young man might well have killed Gross, but in the other cases the prosecution was fabricated. Klein starts to secretly investigate the old case, but soon he is being followed and threatened. The Killing of Emma Gross is a well constructed historical police procedural that is based on the story of the real Dusseldorf ripper, Peter Kurten, using real characters from the case such as Gennat and the pathologist. The story is gritty, edgy and dark, with a nice tension running throughout centred on the fraught rivalry between Klein and Ritter, and Berlin Kripo's presence. The plot is well paced and as it unfolds becomes a real page-turner. The characterisation is excellent throughout, with adequate back story to get a good sense of the main actors, and Klein was engaging as a flawed copper looking for redemption and revenge. Moreover, Seaman does a good job of placing the reader in the Weimar Republic and its unsettled social and political landscape. Overall, a taut, sinister, well told tale and I’d be interested in spending more time in Klein’s company. Great review! I enjoyed the book immensely myself!